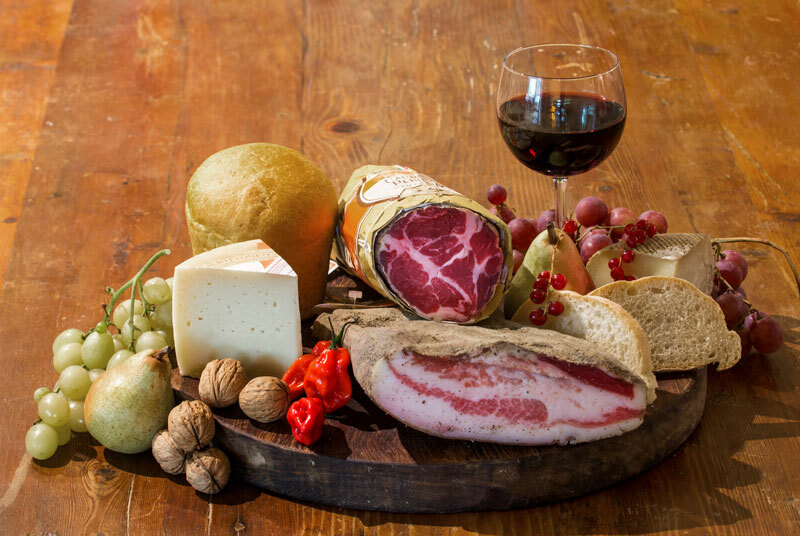 In consideration of its aromatized and slightly sapid taste, this product matches full-bodied structured red wines, homemade bread, aged and semi-aged cheese. Our Capocollo Perugino is derived from the muscle running from the neck to the 6th rib of Italian heavy pigs weighing about 175 kg. Trimmed in order to give it its typical cylindrical shape, it is salted in cooled rooms (4-7°C) and aged for about 90 days. Its tender texture and rounded taste are the result of the white wine, garlic and powdered black pepper flavouring. 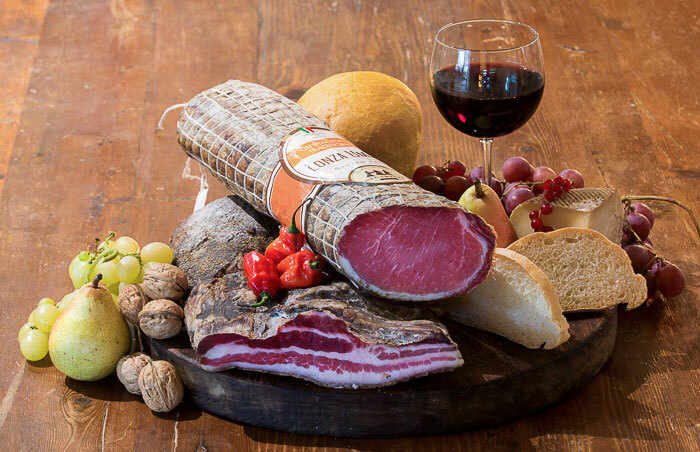 Our Capocollo Perugino is wrapped with greaseproof paper and straw paper and then tied by hand. Its weight is about 1,8/2,2 kg. When cut, the slice looks bright red with whitish fat spots. This product deserves to be combined with full-bodied red wines, homemade bread or croutons, both seasoned and fresh cheese, whose taste is not too strong. Derived from the muscle running from the neck to the 5th -6th rib of Italian heavy pigs, it has a cylindrical shape and weighs about 1,4/1, 8 kg. Its slow salt-cure and its 90 days aging help highlight the tenderness and tastiness of the finished product. Spiced with garlic, white wine and powdered black pepper, it is stuffed into a natural collagen casing and wrapped with an elastic net which keeps it cylindrical. When cut, the slice looks bright red with whitish fat spots. Its delicate taste pairs well both with light red wines and with lightly sparkling white wines. It will not disappoint the most demanding palates if it is combined with homemade bread or croutons and with seasoned and fresh soft or semi-hard cheese. Second only to prosciutto, our pork loin results from the trimming of the dorsal muscle of heavy pigs. A thin layer of fat is left to improve the taste of the product. After being salt-cured for about two weeks, it is aged for 60 days. Its typical cylindrical shape and its size immediately give an hint of its delicious taste. When cut, its compact pinkish slices show their delicate and slightly flavoured taste and prove the expectations given by the first sight. Balanced in taste, in addition to being used as the basis for many traditional recipes (especially the Amatriciana sauce), it may be consumed on the classic bruschetta or combined with homemade bread. It deserves to be paired with full-bodied red wines and/or sparkling white wines. The pleasant contrast created by the combination with aged cheese having a slightly sapid taste emphasizes perfectly its sweetish taste. 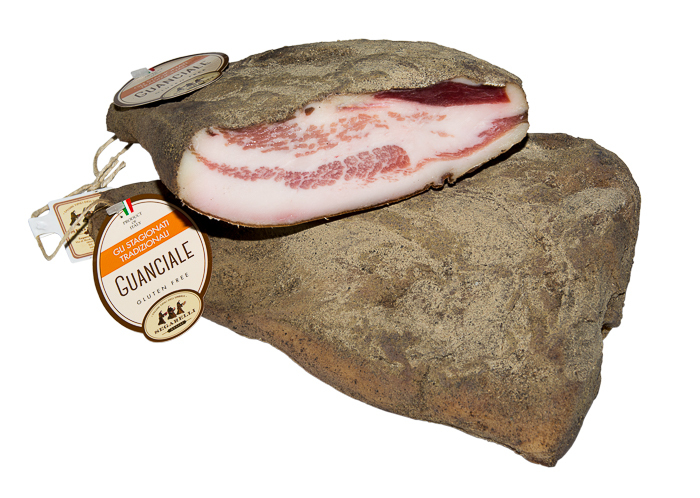 Deriving from the jowls of Italian heavy pigs, our guanciale is cropped in a classic drop shape. The dry salting process with the addition of garlic, pepper, wine and aromatic herbs and the 60/90 days seasoning give this product a delicate and flavoured taste. 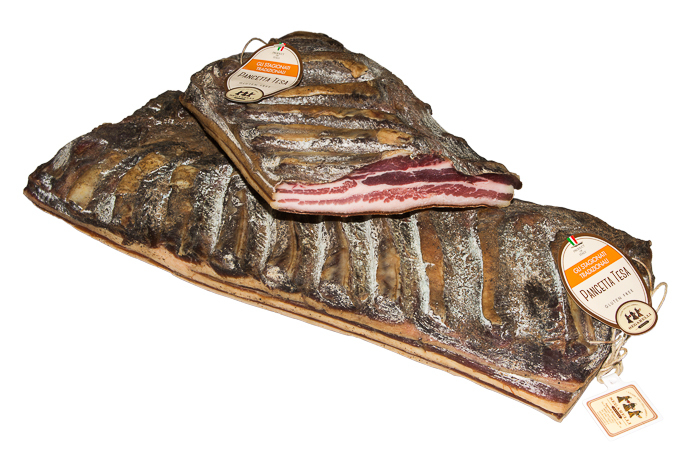 When cut, our guanciale shows alternating fat and lean stripes which make its flavor well-balanced. Its weight is about 1,2/1,4 kg. This kind of Pancetta is often used in many traditional recipes (especially the Puttanesca sauce). It can be eaten on the classic Umbrian Bruschetta or just with bread and it could be perfectly combined with red full-bodied wines. 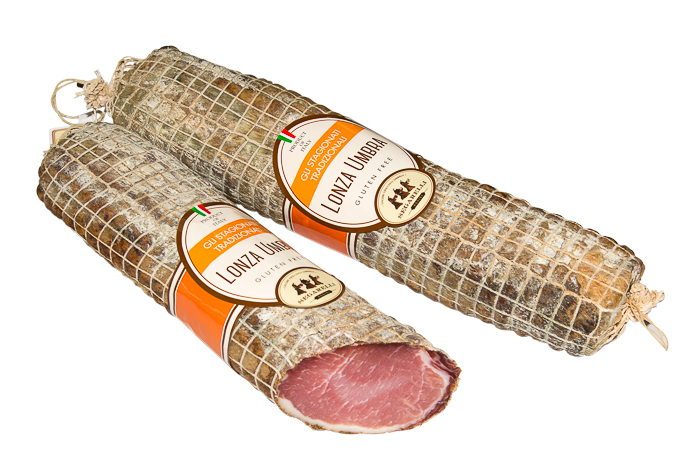 If paired with aged cheese, the particular sweetish taste of this Pancetta is definitely enhanced. Derived from pork belly after taking the ribs away, our rectangular shaped pancetta is salt-cured for one week and then spiced with natural flavourings such as garlic, pepper, wine, laurel, juniper etc. After a 4/6 weeks aging in a cool room, it shows a pinkish slice with alternating fat and lean stripes and a distinctive scent deriving from the spices used in its flavouring process. 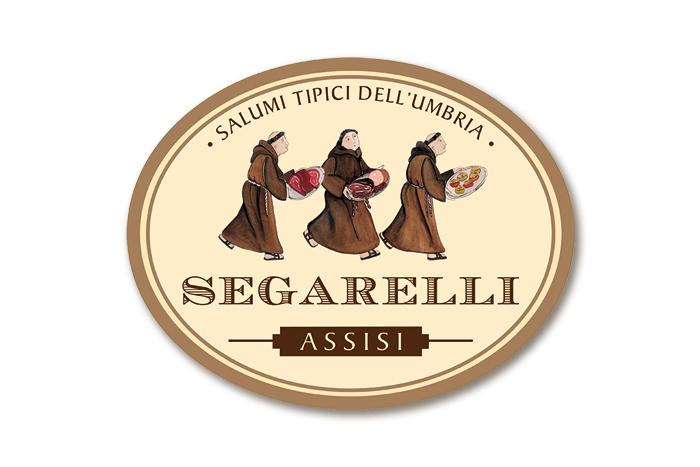 This product is often eaten with other cured meats in the so called Italian “Tagliere”. It is usually consumed with homemade bread, slices of grilled or toasted bread and aged cheese. 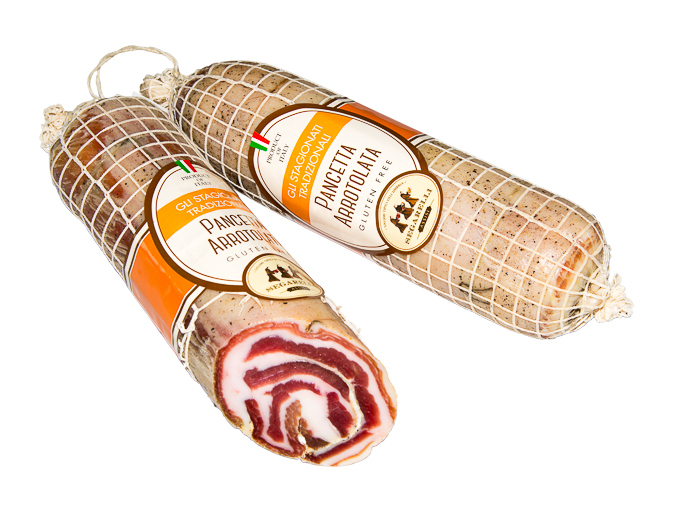 It is suggested to combine this type of Pancetta with full-bodied red wines in order to experience its spiced taste. Its name comes from its traditional shape. In order to have it, the belly of Italian heavy pigs is cropped, its fat part is taken off and the meat is finally aromatize with pepper, garlic and wine. After 30/45 days aging in a cool room, it shows a pinkish slice with alternating fat and lean bright red stripes. Its taste is definite and its scent is lightly flavoured. It is used in the Italian cuisine to prepare traditional recipes such as the Puttanesca sauce. This is aged cubed pancetta.